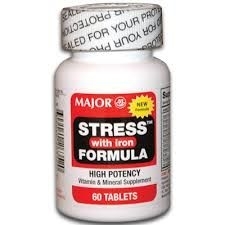 Specially formulated to replace the key nutrients that you need to defend your body against the effects of stress. Read package carefully before using. - if you have ever had an allergic reaction to this product or any of its ingredients. - you have liver or kidney disease. Your doctor should determine if you need a different vitamin. - an allergic reaction to this product occurs. Seek medical help right away. Adults and children 12 years of age and older: Take one tablet daily. Drink plenty of water.